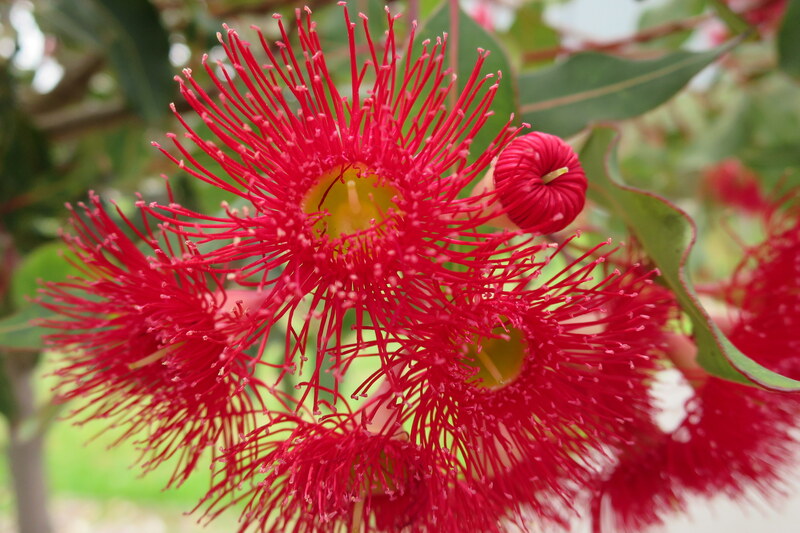 For years I’ve been a snob about flowering gums. They were so brash, so bright, so harsh. They weren’t locally indigenous. But this season, I changed my mind. Just when everything in nature seems to be turning to brown, the flowering gums let loose with colour. The Danks St median in Albert Park is ablaze with flowering gums of various sizes and colours – orange, red and pink. It’s alive with feasting bees and screeching lorikeets flying low and horizontal between the trees. On grey dull days, the trees light up the suburb’s streets. The trees shape also seems to become more definite and sculptural when they are in flower as if arranged for floral display. Only a wowser could take exception to so much colour, abundance and life. 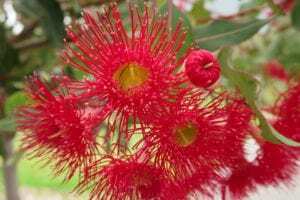 The flowering gum’s proper name is Corymbia ficifolia… a “corymb” referring to floral clusters where all flowers branch from the stem at different levels but ultimately terminate at about the same level. Until ten years ago, the median in Danks St between Pickles St and Esplanade East was used for carparking. Resistance to the removal of parking was intense. New trees have been planted, and although some of them are struggling in the summer heat, a median edged with flowering gums gives much more joy.